This photograph is of Topeka's 1904 minor league club in the Missouri Valley League. (An inscription on the photo gives the league name as Western Association, but the change in the league's name was not adopted until November 30, 1904.) The Topeka Daily Capital referred to the team as the Boss Busters, while the Topeka State Journal called them the Saints. The team finished the season with a record of 45-78, which ranked seventh among the league's eight clubs. Players in the top row are, from left to right: John Schrant (c); Bert Dunn (2b); Tom Hughes (p); Spencer Abbott (1b and team manager); George Hurlburt (cf); and William Howie (p). In the bottom row are, from left to right: Richard Brown (3b); Edward McDill (utility); Ed Shinners (rf); Clarence Cole (lf); and Sylvester Olson (ss). [Note: some of the player names are spelled incorrectly in the handwritten inscriptions on the photo.] The photograph was made in the latter part of the season, since some of the players pictured did not join the team until August. More than 30 different players were affiliated with the team over the course of the 1904 season. 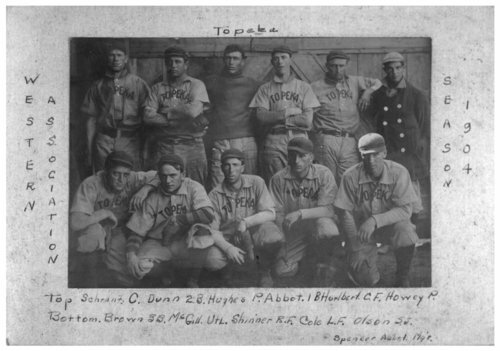 This photograph is of Topeka's 1904 minor league club in the Missouri Valley League. (An inscription on the photo gives the league name as Western Association, but the change in the league's name was not adopted until November 30, 1904.) The Topeka Daily Capital referred to the team as the Boss Busters, while the Topeka State Journal called them the Saints. The team finished the season with a record of 45-78, which ranked seventh among the league's eight clubs. The photograph was made in the latter part of the season, since some of the players pictured did not join the team until August. More than 30 different players were affiliated with the team over the course of the 1904 season.